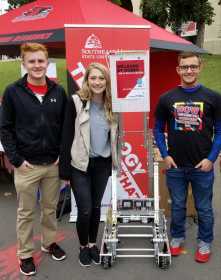 Robotics club officers Nathan McKlin (UAS major); Hannah Seyer (Technology Management major); Brigham Haase (UAS major) standing with their robot during homecoming. Hannah Seyer, the lone female on the Southeast Robotics Club, mentors young girls in robotics and helps them overcome the stereotypes placed on women in STEM . Seyer said she believes in pushing past stereotypes behind being female because she learned to present herself in ways people can’t doubt what she can do. “Even though you are a female you can be good at this, you can excel at this, it doesn’t matter what gender you are for what field you are going in to. For some reason it’s a hard concept for people sometimes,” Seyer said. Seyer was part of an all girls robotic team in high school after being introduced to the robotics club by her industrial arts teacher. She has been a mentor there since graduating and has started coaching this year. Seyer also is on the executive board of the robotics club and serves as co-president and takes on an important role. She also assists with teaching and helping design as well as recruitment and coding of the robots. 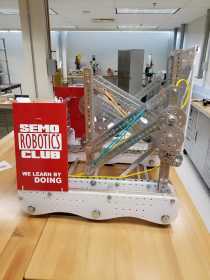 Close-ups of the Southeast Robotics club robot without the extended arms. Seyer said she is trying to recruit girls because she wants more girls on the team. “I think it would be awesome, especially going to more recruitment events if we had more females on the team,” Seyer said. “It would show younger girls that you can continue on even if they are just doing a little bit of robotics in high school or they think they might be interested in it,” Seyer said. Seyer encourages all women to follow their dreams regardless of what others may say or think. Hannah Seyer leading the robotics club in building in a robot. Seyer said she no longer worries what others think of her being a woman in a male dominant field because of the different things she experienced in high school. “We were on an all girls robotics team and when we started out there was a lot of doubts as to did we really build it, could we have done that on our own kind of thing. That is another reason why I like to mentor and coach the girls now because it helps them gracefully handle approaching ‘just because I am a female doesn’t mean,’” Seyer said. Seyer said she hasn’t faced any struggles at the college level being a female in the STEM field. However, she did face struggles when she was younger and first got interested in robotics. “Being on that all girls team those first two years there was a lot push back because it wasn’t seen a lot before and people couldn’t believe that a group of high school girls would be able to do as well as we did,” Seyer said. Seyer started out at Southeast as a computer science major and shortly realized it was not the right fit for her. Although she enjoyed it, it was not something she could see herself doing for the rest of her life. With the help of professor Belinda McMurry in the Polytech building, Seyer realized her true interest was in technology management. McMurry helped customize the major to fit her. Seyer said she likes the problem solving of robotics and the fact that she can see the process from start to finish. It’s what got her hooked. “When there were competitions it was like ‘Here’s your problem, what are you going to build to fix it or accomplish this goal?’ but then it’s going through designing and being able to build it and getting to code it and in the end, getting to see it turn out how you wanted it to,” she said. Seyer said she wanted to help the robotics club grow once she switched her majors because it was something she enjoyed. 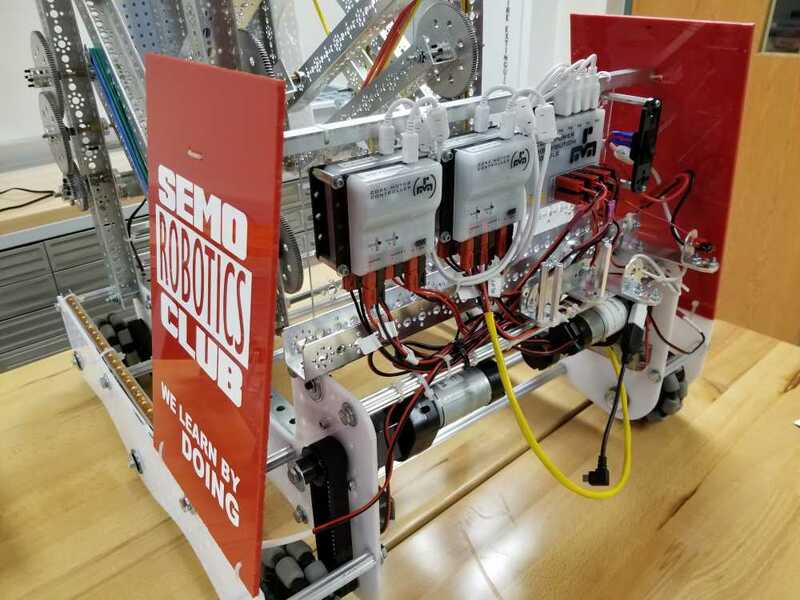 “I really wanted to do the robotics club here because they already had one when I came in so I knew I wanted to be a part of that and help that grow,” Seyer said. She said she loves the idea of being able to learn more each year, especially code switching and problem solving. “You learn to solve things in different ways to do it better the next time and different prototypes,” Seyer said. Seyer said she plans to graduate in December and enter the technology management master’s program offered at Southeast and be a graduate assistant.